Bitcoin went from an anti-establishment fad on the internet to a multi-billion dollar market in just 10 years. Its underlying technology, blockchain, is being embraced by banks like J.P. Morgan and tech giants like Amazon and Facebook. The market is still maturing, with no lack of skeptics who doubt bitcoin’s legitimacy as a means of payment or a sound investment. The entire cryptocurrency market capitalization is now $200 billion and bitcoin makes up more than half of that total, with a market value of about $110 billion, according to CoinMarketCap.com. Ten years ago, as Lehman Brothers was declaring bankruptcy and the global economy was lurching into recession, the idea for an alternative currency was being quietly built online. On October 31, 2008 bitcoin was born — and in the past ten years has evolved from an anti-establishment hobby among coders to a household name on Wall Street. The first and most-famous digital currency sparked mania among retail investors last year and despite being founded to bypass them, has caught the attention of some of the world’s most powerful institutions. Perhaps the most confounding thing about bitcoin is its origin story. It was invented by an anonymous cryptographer going by the pseudonym Satoshi Nakomoto. He, she, or they, wrote bitcoin’s founding white paper a decade ago on Halloween, claiming online to be a Japanese man. But some speculated that was unlikely based on the perfect English, and bitcoin’s software not being labeled in Japanese. The conspiracy theories and clues are endless. British spellings and phrases like “bloody hard” on online forums hinted that Satoshi was English, while timestamps from emails suggested that the founder could be American, Irish or Finnish. Tesla CEO Elon Musk is among those who have been accused of being Satoshi, though he denied it. Multiple others “admitting” to being the founder have since been discredited. The code is so impressive, others say, that it must have been written by multiple people. As bitcoin started to gain popularity, Satoshi emailed a fellow bitcoin developer saying they had “moved on to other things.” Satoshi went radio silent on public forums by 2011 and passed the reins to Gavin Andresen, a software engineer, who became the chief developer of the open code that refines the bitcoin protocol. But Nakamoto didn’t walk away empty-handed. Sergio Demian Lerner, an Argentine researcher, has estimated that Nakamoto accumulated around one million bitcoins before disappearing. Today, that stash is worth over $6.2 billion. Bitcoin’s original goal, according to its white paper, was straightforward: A “purely peer-to-peer version of electronic cash would allow online payments to be sent directly from one party to another without going through a financial institution.” Satoshi’s idea solved for the “double spending” problem that other failed digital currencies, like e-Cash or DigiCash in the 1990s, ran into. In order to make sure payments didn’t need a third party like a bank, bitcoin would rely on “distributed ledgers,” which could be seen by anyone to verify that the money actually changed hands. The network records transactions and put them onto an ongoing chain, forming a record that can’t be altered. That technology is widely known as blockchain, and is now being applied to industries like healthcare, farming and mortgages. The first-ever bitcoin transaction took place just over a week later from Satoshi to the late software developer Hal Finney. It began gaining traction in online forums, and by 2009 the first fifty bitcoins known as the “Genesis block,” was mined. Mining is the energy-consuming process, done on high-powered computers, to solve math equations that confirm transactions on that public ledger. In order to trade it, the first exchange, called “dwdollar,” came on the scene. A few months later, the first real-world transaction in bitcoin took place. At the time it had no real value. But a Jacksonville, Florida programmer paid 10,000 bitcoins for a pizza in May of 2010, which at the time using bitcoin’s newly established exchange rate was worth about $25, according to CoinDesk. At October 2018 prices, he would have paid $63 million for that pizza. By the end of 2010, it was emerging as a real currency with the first mobile transaction and its total value topping $1 million. Mt. Gox put bitcoin on the map — but not in a way some would have hoped. The Tokyo-based bitcoin exchange launched in 2010 and three years later was handling roughly 70 percent of all cryptocurrency transactions in the world. The site was founded by Jed McCaleb, who later went on to found crypto projects Ripple and Stellar. But he later sold before it went under. The site experienced its first of multiple hacks in 2011, when bitcoin reached a price milestone of $1. It was later effectively frozen out of the U.S. banking system for regulatory issues, and by 2013 stopped trading, closed its website and filed for bankruptcy protection. Silk Road was another smudge on bitcoin’s reputation. The dark web marketplace facilitated transactions for guns, drugs and other illicit goods, mostly with bitcoin. It became known as the currency of choice for criminals, which is still how it’s categorized by those who doubt bitcoin’s place in modern finance. The digital currency plunged after U.S. law enforcement officials shut down Silk Road. In 2015 its creator Ross Ulbricht was sentenced to life in prison. Many expected demand to dry up after the website was closed. But in the following years, the opposite seemed to happen. For some, the government seizures in those years presented an opportunity to buy. Venture Capitalist Tim Draper was among those who bought bitcoin in government auctions after Mt. Gox closed down, and has since called it “the greatest technology since the internet.” Tyler and Cameron Winklevoss, who famously battled Mark Zuckerberg over the origins of Facebook, bought the cryptocurrency in 2013. 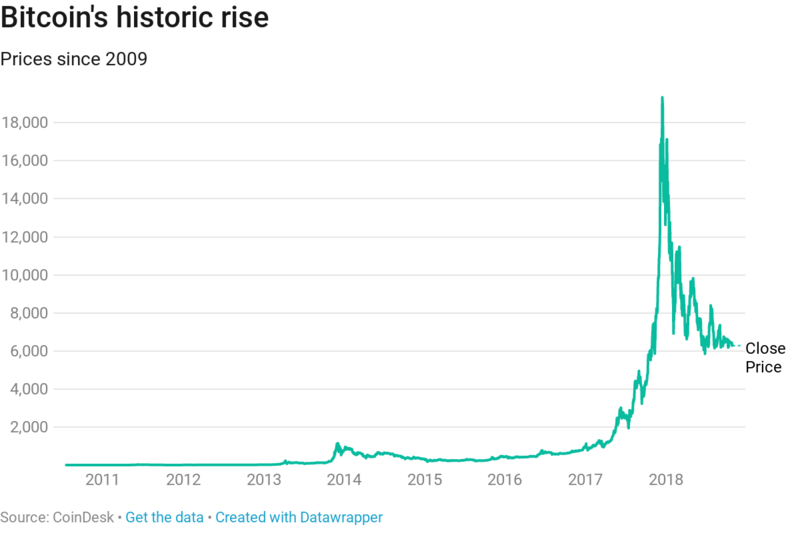 Bitcoin made it to almost $1,000 that year but it took until 2017 to actually break that price threshold. Cryptocurrency exchange Coinbase, recently valued at $8 billion, was founded around the same time in 2012. BitPay, the largest merchant services provider, started in 2011 and opened up a space for merchants to start accepting bitcoin. The currency made its way from the digital to physical world with the first-ever bitcoin ATM at a Vancouver coffee shop by 2013. But aside from gimmicks, bitcoin’s use as a real currency hasn’t truly caught on. A key part of that is volatility, since the cryptocurrency’s value is known to whiplash by hundreds of dollars in a single day. Still, Overstock.com, Newegg, Expedia, Microsoft, Dish Network, OKCupid, CheapAir and Etsy are among the companies that have historically accepted bitcoin for certain payments. By 2017, investors were using bitcoin more as a speculative bet than as a vehicle for buying pizza. It has been compared to digital gold — with a limited supply (21 million exist, and of that, roughly 17 million have been mined), and potential as an alternative investment, and a safe haven currency in turbulent times for stock markets. That use case seems less likely though, as bitcoin has struggled to recover to its high even among trade wars, Brexit concerns and struggling global currencies. Many retail investors were driven by FOMO, or “fear of missing out” at the end of last year. Bitcoin began last year below $1,000 and by December was trading above $19,000, bringing its total gains to 1,300 percent, according to CoinDesk. Those gains brought in a new era of crypto millionaires, who in some cases, publicized their gains andLamborghinis on Twitter. It has since dropped more than 60 percent, and was trading near $6,300 as of Wednesday. Bitcoin’s all-time high coincided with the launch of what many hoped would make it mainstream — the launch of a futures market. Peak prices lined up with the day the Chicago Mercantile Exchange, or CME, introduced bitcoin futures trading on Dec. 17. That same day, bitcoin hit a high of $19,783, according to data from CoinDesk. The Chicago Board Options exchange, or CBOE, also opened a futures market a week earlier. “Futures” let an investor bet that the price price will hit a certain level without having to buy the asset itself. The Intercontinental Exchange, parent company of the New York Stock exchange, plans to introduce another form of futures in December through a new joint venture called Bakkt, also supported by Starbucks and Microsoft. As bitcoin’s value climbed, other cryptocurrencies and a fundraising method known as initial coin offerings, or ICOs, climbed with it. An ICO is a fundraising method in which a startup, usually blockchain-based, raises money to build a business. Typically, all that is needed is a website landing page and an idea laid out in a white paper. The “tokens” or cryptocurrencies sold through ICOs promise a future payoff, or in the case of Ethereum, are used to access the actual blockchain platform. The fundraising method started in 2013, but was made famous last year as it brought in billions from retail investors. Thanks to ICOs, there are more than 2,000 cryptocurrencies in existence, according to CoinMarketCap.com. Many have failed since their inception but the entire cryptocurrency market capitalization has managed to climb above $200 billion — bitcoin makes up more than half of that total, with a market value of about $113 billion, according to CoinMarketCap.com. ICO crowdfunding has raked in $12 billion this year alone, more than the total initial public offerings on major U.S. exchanges, according to the latest data from Autonomous Next. Many were outed as frauds and subpoenaed by U.S. regulators who repeatedly warned of “pump and dump” schemes. The Securities and Exchange Commission even launched its own scam ICO website to show investors how to avoid falling for one. Tech companies Google, Facebook, and Twitter bannedcryptocurrency advertisements earlier this year, also citing an effort to protect retail investors from fraud. The popularity ushered in new buyers, and the attention of regulators. Since it’s not backed by a single government, no single entity is in charge of overseeing bitcoin. Each country, and even different states within those countries have fragmented rules on how they treat the new asset class. Global regulators are still reconciling how to handle “know your customer” and anti-money laundering requirements, while not cracking down too hard on what could be an innovative new asset class. The Securities and Exchange Commission has explicitly said that bitcoin and ether, linked to another blockchain platform launched in 2015, are commodities. But all other initial coin offerings are securities, and therefore should be regulated by the SEC. While industry leaders have increasingly called for more clarity, SEC Commissioner Jay Clayton has said he does not plan on changing the rules for crypto. A law change would take an act of Congress, which members of the House left as an open possibility in their September letter to SEC. Wall Street has slowly but surely accepted bitcoin as a mainstream investment. Goldman Sachs CFO Martin Chavez said the bank is working on a bitcoin derivative known as a “non-deliverable forward,” because of demand from clients. The bank’s now former CEO Lloyd Blankfein tweeted in October that Goldman was “still thinking about bitcoin,” and that the bank was “not endorsing/rejecting.” Goldman Sachs has been clearing bitcoin-linked futures contracts offered by the CBOE and CME since May, and is providing clients liquidity for those futures. As for physical bitcoin, Goldman is not quite there yet. Its CFO underlined the need for a safe custody solution before the bank could move forward. Since those comments though, Fidelity has stepped in to fill that void. It announced a custody solution, and New York regulators approved Coinbases’s own custody solution last week. The new industry has seen more and more collaboration between Wall Street and native cryptocurrency companies themselves. Seventy-two year old Fidelity, which thanks to its crypto-friendly CEO has been an early leader in the space, teamed with Coinbase so customers could see their crypto balances. Nasdaq announced a collaboration with cryptocurrency exchange Gemini, founded by Tyler Winklevoss and Cameron Winklevoss. The deal gave Gemini access to Nasdaq’s surveillance technology to help provide a fair and “rules-based marketplace” for their own participants. Nasdaq CEO Adena Friedman said earlier this year the company was “open to becoming a crypto exchange”. She told CNBC in April that once the space “matures,” Nasdaq would consider becoming a digital-currency exchange — but for now, she says, is more comfortable acting as a partner. Perhaps the biggest vote of confidence has been from notoriously careful institutional investors. Yale’s endowment CIO David Swensen has invested in at least twoventure capital funds that deal in blockchain and cryptocurrency. While it’s not clear that those investments are in bitcoin itself, the reports were seen as a bullish sign for the industry’s future. Despite the recent interest, the SEC has yet to approve a bitcoin ETF. The agency published a letter in January pointing to “significant investor protection issues that need to be examined” before sponsors can offer these funds to retail investors. Those investors had been awaiting the approval of an ETF this summer, momentarily pushing prices above $8,000. But regulators have repeatedly held off, citing investor protection, and potential for fraud or manipulation in the markets. In July, The Securities and Exchange Commission rejected a second attempt by Cameron and Tyler Winklevoss to list shares of what would be the first-ever bitcoin ETF. Some of Wall Street’s most closely followed CEOs are less excited by the idea of bitcoin. J.P Morgan Chase CEO Jamie Dimon called it a fraud. Berkshire Hathaway’s Warren Buffett, who has repeatedlywarned against bitcoin, famously likened the cryptocurrency to “rat poison.” Citadel’s billionaire hedge fund manager Ken Griffin is one of the many who has called out similarities between bitcoin and the most famous financial bubble of all time — the Dutch tulip bulb mania. Even if bitcoin doesn’t survive another ten years, many on Wall Street are betting that its underlying technology will. J.P. Morgan Chase, IBM, Deloitte, Amazon and Facebook are among those working on private blockchain solutions for businesses, which for the most part have nothing to do with cryptocurrencies. Meanwhile, merger and acquisition activity for blockchain and cryptocurrency companies has more than doubled in the past year amid a 54 percent slump in bitcoin prices, according to JMP Securities and data from PitchBook. Executives now seem to be going through the same “FOMO” for blockchain as retail investors experienced with bitcoin at the end of last year. In a report published by PwC in August, 84 percent of executives surveyed said their companies are “actively involved” with the technology. “Everyone is talking about blockchain, and no one wants to be left behind,” according to PwC’s 2018 Global Blockchain Survey, which included 600 executives from 15 territories.